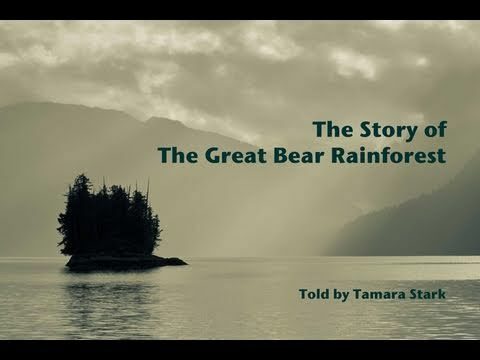 The Great Bear Rain forest is the only remaining temperate rain forest in our world. It is located on the western coast of British Columbia in Canada. And the legend goes that after the Great Ice, Raven wanted the world to remember the damage of the Ice Age. So she spoke to Black Bear; the keeper of dreams and memories. Raven promised Black Bear that he would enjoy a peaceful life if he taught the world about the damage of the Ice Age. For every ten of Black Bear’s offspring, one would turn white and be known as Spirit Bear. Spirit Bear, or moskgm’ol will bring peace and protection to the Great Bear Rain forest..
During the nineties, the BC provincial government granted licenses to the major logging companies to permit clear cutting of our last remaining temperate rain forest. This angered the environmentalists, the scientists, the First Nations and many people who believed and practiced social responsibility. Everyone had an opinion and everyone had a loud voice. But no one was listening. It was a time of anger and finger pointing. And with all the negative talk and no action, more and more of the Great Bear Rain Forest was permanently lost. Loggers were angry. This was the only work in the area. This work provided for their families. They had mortgages and bills to pay. They worked hard and they were proud of the work that they did. Their fathers and grandfathers had been loggers. It was a way of life. It was their way of life. The Kiatsoo First Nations were angry. This was their home and had been for generations. The salmon provided food. The earth provided food and shelter. With each and every clear cut tree, their world was forever threatened. It would be the end of their way of life. But only Spirit Bear saw and remembered that only action and not yelling could minimize the damage to the earth. So Spirit Bear whispered into the hearts of some. The logs were being shipped to Europe, far away from the fighting and yelling and finger pointing. Did the people buying the logs even know how they were harvested? How do we create a solution that protects all ways of life? The answer was in business process re-engineering. What? And so Spirit Bear whispered in the ears of many, tell the truth and see if all stakeholders want the world to return to a barren earth like it did when the ice was here. So Greenpeace went to Europe and showed the customers the clear cut forest. The German customers came to the Great Bear Rain forest in western Canada and said that they would only buy wood from companies that practice sustainable logging. The investors became aware and said that they would only continue their investment if sustainable forestry practices were followed. The logging companies sat down with the loggers, the NGOs, the Aboriginal community, the politicians, the scientists, the environmentalists and the investors and together they developed a plan. The objective was to protect all ways of life. The loggers could continue in the ways of their fathers and grandfathers. They could work hard and be proud of their work in sustainable forestry. 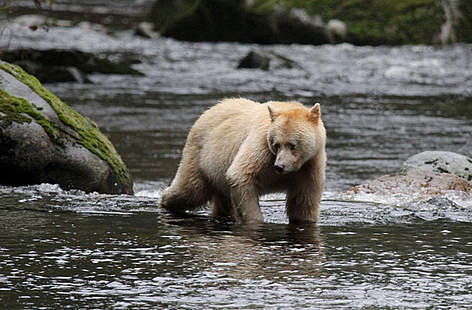 The Kiatsoo First Nations could continue to fish and hunt and protect Spirit Bear. They could continue to be proud of their way of life and their traditions. The environmentalists and the scientists could study the rain forest, discover new life and work to sustain it. The NGOs could continue to create awareness and protection for the community and ecosystems here and in all areas of risk. The politicians could introduce legislation to preserve peace, the economy and the ecosystem. The customers had a strategic supplier committed to sustainable forestry which gave them brand leverage for their manufactured products. The investors had mitigated the risk of an unsustainable revenue flow within their investment portfolio. It took time to build and time to implement. But it is not only a success story, it is a best practice that can be used in the Congo, the Amazon and other areas which are at risk. The Great Bear Rain forest protected 70% of the forest and preserved everyone’s way of life. This is a model agreement. We live in an interconnected world. Change can happen when we stop and respect the needs of each side of a polarized position. Business process re engineering needs to again bring all the stakeholders to the table and with strong facilitation, we will get past the violence on social media and in the traditional media. We need to listen to each side and develop a respectful solution in response to Climate Change. This entry was posted in Inspiration and tagged build, business, csr, Hope, Inspiration, leadership. Bookmark the permalink.